Interpipe, the heavily indebted Ukrainian pipemaker owned by Victor Pinchuk (centre), owes at least $120 million to Russian banks, led by state-owned Sberbank controlled by former Minister of Economic Development, German Gref (wall picture, left). But the Russian bankers are not represented in any of the loan restructuring negotiations which are currently under way, following Interpipe’s default on $106 million in debts owed to its international lenders on November 1. The Russian debt and the Russian influence over Interpipe’s financial survival have been disclosed by Interpipe executives at a briefing for Interpipe’s Eurobond holders on December 9. The Russian loan agreements carry standard protective clauses allowing a call for full repayment when Pinchuk and his holding are in default to other lenders, suppliers, or creditors. If the Russians decide to do this, Interpipe’s executives acknowledge they cannot pay. They have less than $90 million in free cash at present, and admit they cannot borrow extra money. This vulnerability is acute at the moment. Pinchuk has been the principal financier of anti-Russian lobbying for the Ukraine in Europe and the US. He has made large donations to former prime minister Tony Blair in London, and to former president Aleksander Kwaśniewski in Warsaw, both promoters of Ukrainian opposition to Russia. Pinchuk’s registered lobbyist in Washington, Douglas Schoen, has been a pollster in Ukrainian opposition politics. Schoen has also been working for two years at a fee of $40,000 per month to ensure the US political elite, including former President Bill Clinton (wall picture, right) and presidential candidate Hillary Clinton, support the anti-Moscow forces. Sberbank declined to respond to questions about the bank’s intention to call in Interpipe’s debt. However, Alisher Usmanov, the owner of Russian steelmills and iron-ore mines, has authorized one of his mills, Oskol Electro-Metallurgical Combine, to file suit in the Arbitrazh Court of Belgorod region against Interpipe, claiming $23 million in unpaid bills, penalties and interest. There are six lawsuits covering the supply by Oskol of steel billets which Interpipe used in pipe fabrication before its newest steel-making furnace at Dniepropetrovsk was commissioned in October 2012. First hearings of the claims are scheduled between December 16 and January 20. Interpipe has announced that since last month’s default, the European banks and SACE, the Italian export finance agency have set up “a managing committee, with whom Interpipe will hold a constructive dialogue to reconcile conditions required for the maintenance of the process. The parties will have to agree upon the amendments to the schedule of repayments for the principal pool loans, as well as some other amendments to the loan agreements.” It was revealed this week that the committee comprises SACE, along with ING, Commerzbank and Royal Bank of Scotland. Altogether, Interpipe claims they are owed about $400 million. The total owing is about $1.3 billion. Interpipe also admits that the Russian bank loans of $120 million were authorized after the 2011 restructuring was signed with the European banks. The Interpipe financial report for 2012, released this August, claimed there were three “facilities outside of restructuring scope”, comprising $50 million in Euros, $48.8 million in roubles, and $10.1 million in hryvni (see page 41). The lenders were not named in the report. The sum owed to the Russians appears to have grown by 10% since the start of this year. Pinchuk’s role in the polarization of the Ukraine into pro-Russian and anti-Russian camps is documented in reports Schoen has been required under US law to file at the US Department of Justice. Based in New York, Schoen is officially registered as the American agent for Pinchuk, his foreign principal. The six-monthly reports reveal how much Schoen has been paid – more than $1.2 million so far — and the extensive pattern of contacts he has made with the White House, and with State Department officials around Hillary Clinton, when she was Secretary of State. Clinton friends and campaigners who have been associated with Schoen’s lobbying campaign, include the US Ambassador for Women’s Issues, Melanne Verveer, and Nancy Soderberg, a national security advisor and UN Ambassador. The latest Schoen report, registered this week, does not explain how the two Clintons were compensated for attending to attend Pinchuk’s conference in September to promote the agreement with the European Union which Yanukovich has now rejected. Bill Clinton’s endorsement of former Ukrainian president Leonid Kuchma, Pinchuk’s father-in-law, created so much embarrassment in American human rights circles that he avoided being seen publicly with Kuchma and Pinchuk for years. 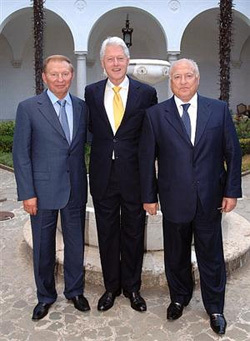 In this photograph taken at Yalta in June 2007, Kuchma is on Clinton’s right; Victor Chernomyrdin, a Russian prime minister who became the Kremlin’s ambassador to Ukraine, is on Clinton’s left. Clinton’s conduct triggered hostile US press coverage like this. 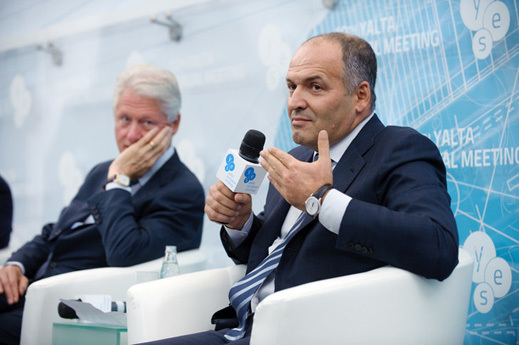 Clinton’s caution was dropped in September of this year, according to Pinchuk himself. In 2012 Pinchuk also arranged for Chelsea Clinton (left), daughter of Bill and Hillary, to visit Ukraine under his auspices. At the time, according to Schoen’s reports to the Justice Department, Pinchuk’s cash was being paid to influence the outcome of the Ukrainian parliamentary elections, which took place on October 28, 2012. The full Pinchuk file on Schoen’s activities can be read in this archive; the Pinchuk file is registration number 6071, and there are seven reports to date. According to the file Pinchuk has also engaged David Goldin, a public relations spokesman for US politicians, who specializes in kompromat. Schoen calls himself “one of the most influential Democratic campaign consultants for over thirty years”. His operations in Venezuela with the local political opposition to the former president, Hugo Chavez, have been called fraudulent. According to Pinchuk and Schoen, “approximately $1,000 of the payments received this period [June 1-November 30, 2013] were attributed to lobbying work”, and the remainder of Schoen’s paid time went to “philanthropic work”. Schoen was asked to clarify what the difference is between the two types of fee-paying work he is doing for Pinchuk in the US and Ukraine. He was also asked to say what work he is currently doing on Pinchuk’s tab for the Ukrainian opposition. Schoen is refusing to answer.